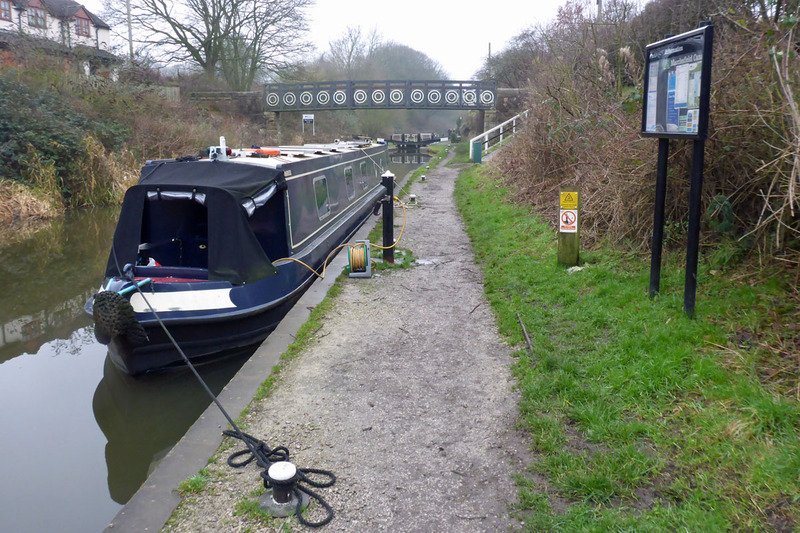 Fifty yards shy of the full circle #narrowboat #canal #England – The Diesel-Electric Elephant Company. Set off this morning with the best of intentions. Wasn’t going to try for Calais, but did intend to turn the boat around, scoot off the Macclesfield, down at least five locks and be back on the Trent & Mersey somewhere outside CaRT’s Red Bull offices by the time of my appointment with the wooden hill to Bedfordshire. Well, I turned the boat around. That much I did. Not such a shortfall as you might imagine, since to do so required a cruise-ette of some 4¼ miles and both ways through one, very silly, lock. There’s the lock in the background of the lead photograph. Hall Green lock is its name, and it’s one of those ruddy silly ones with a 12″ difference in the water levels. All of the same work of a “proper” lock, none of the navigational achievement. Hall Green lock is actually even sillier than most, since it has lock landings but they are quite useless, because the shallow rock edging means that even a boat of the Cardinal’s modest 27″ draft can’t get closer to dry land (soggy, subsiding bank turf, out-of-control reeds, and compacted dog-poo) than mayhap a yard or so. As ever, this is not a problem if you have a crew of thousands who jumped eagerly off the boat at the last bridge-hole, jogged ahead and will jump back on the boat at the next bridge-hole, but it is a tad of a disconvenience if you are a boat of one. I do sometimes rather gain the impression that we single-handers are the scum of the not-welcomes. Bollards I say in reply, bollards. Fortunately – for I am sure that it is not by ancient design – in one direction there’s a lead-in to the lock where you can wedge a boat without fear of Somali pirates, and in t’other direction there is a water point with real moorings. That is where the Cardinal is sitting in the photo, on the water point – while I did indeed take the oportunity to refill the main tank, and then walked back the extra to close up the lock. After the water point I mooched on another mile or so to the first winding hole, just beyond the “NO TURNING” marina, home of “Heritage Long Boats & Barges” [sic]. Odd name for a marina, but that’s what the huge, friendly sign read atop the bridge across the entrance. I won’t grace Heritage boats with a link, since that would aid their Gooble ranking, and one good “NO TURNING” deserves another. It was ruddy cold. The lack of meteorological ergs assisted no end with my decision to cut short our cruising for the day and to tie up just about right slap bang where we’d set off from, the Cardinal and I. Me and Mr Wolsey. One and him. My breakfast bananas had worn off, too, by the time the “old” moorings came back into view. After I’d got the planet Earth re-tied to the Cardinal I was pleased to note that Mr Stove was still well “in”. When he’s in a good mood he has no problem remaining untended for three, four, five, sometimes even six hours at a pinch. I lobbed some more faux-coal briquettes in, re-brewed a caffetiere of the hot black stuff and squbble and beaked yesterday’s left-over vegetables into a hot good gracious me yes indeed. We’ll probably try again tomorrow. I probably ought to find a fresh new book and go to my cabin extra-extra-early this evening, just to build up my strength for tomorrow. At least this time we’re on nice “visitor mooring” rings, and not nappy pins. You have convinced me that I don’t have the patience for narrowboat life. So much effort just to turn around so you are facing the direction you want to go. These winding holes need to be every 500 feet in my opinion. Possibly the entire canal system should be widened to windable at any given moment. Although, imagine the foolish things people would do with that much space…. OK. Maybe just more regular winding holes. That sounds like the sort of day that just orders you to sit around the stove with the pot of black stuff and a book. But, again, at least it wasn’t Stoke. You do make me chorkle sometimes. It amazes me how much you do get done and if it’s as cold out there as it is in here – goodness me! I may invest in a balaclava as well as these fingerless gloves (and I’ve got the central heating on) and they do threaten us with even harsher weather. eek!